Hoof supplements are widely used within the equine community- we've all heard the saying "No Hoof, No Horse". Weak hoof structure leads to hoof wall problems such as quarter cracks, toe cracks, sand cracks, brittle hoof walls and hoof wall separation. These hoof wall defects often create an environment ideal for bacteria associated with white line disease, crumbling horn and abscesses. Whilst frequent, routine farriery is key to maintaining good hoof quality and balance, a supplement could help to build strong connective tissue important for healthy hoof structure and growth. In theory if a horse is fed a good complete diet then they should have all the vitamins, minerals and proteins needed to build quality horn and promote hoof growth. However this is not always the case and we are not entirely sure why. A lot of it is likely to be down to genetics- we have selectively bred horses for speed, stamina, exuberant paces and scope rather than good feet. 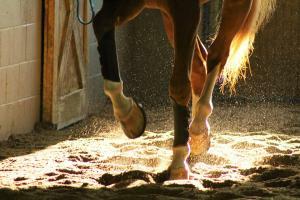 Studies have begun to show that supplementing with a hoof supplement can be helpful. Biotin- A water soluble B vitamin that is required for cell growth and division and strengthening the bonds between collagen fibres in connective tissue found in the coat and hooves. Horses are unable to synthesize biotin themselves so rely on obtaining it through their diet and synthesis by bacteria in the gut as they break down fibre. 20mg of biotin a day is thought to help promote healthy hooves. Methionine- An essential amino acid which means, like biotin, that the horse can't produce it on its own. It is a major structural component of proteins in the body and play a role in the maintenance of the hoof. Zinc- A trace mineral involved in maintaining the integrity of the hooves and reinforcing keratin. Keratin is the protein which protects epithelial cells from damage and is the key structural material making up the outer layer of the horses hooves, skin and hair. Absorption of zinc is closely linked to the amount of other trace elements in the diet such as copper. Calcium- Another mineral, responsible for assisting in the creation of sulphur cross-links between hoof proteins that allow for cohesion among cells. The stronger the cohesion, the more healthy and impenetrable the hoof. Horses hooves grow slowly at a rate of around 7-9mm a month. If you start feeding a hoof supplement it is likely to take around 6 months until you start to see a difference. Therefore it is best to pick one supplement and persevere with it for at least 6 months before deciding whether it is of benefit to your horse or not. In the meantime a good balanced diet and routine farriery are essential too.